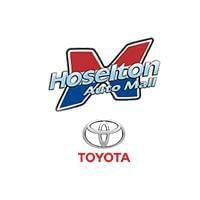 Hoselton Toyota is part of the Hoselton Auto Mall in East Rochester, New York. Hoselton Toyota has been proudly serving the Rochester, New York area since 1920! We are located on the corner of Fairport and Marsh Roads in East Rochester, New York. Shop 17 acres of new and pre-owned vehicles all in one location! We are only 15 minutes from the city of Rochester and just off I-490. We have satisfied customers from Buffalo to Syracuse, New York including: Bergen, Churchville, Spencerport, Chili, Gates, Hilton, Greece, City of Rochester, Henrietta, Rush, Scottsville, Webster, Irondequoit, Fairport, Pittsford, Penfield, East Rochester, Victor, Macedon, Palmyra, Walworth, Canandaigua. We have new and pre-owned options to fit your vehicle needs! Check back often for: new vehicle specials, national rebates and incentives, military rebates and discounts, college grad rebates, pre-owned specials, and vehicles priced under $12,000 .